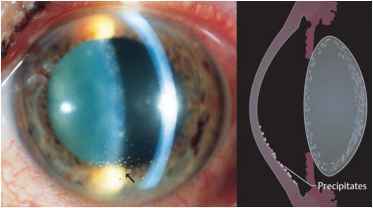 ❖ Contusion cataract: Contusion of the eyeball will produce a rosette-shaped subcapsular opacity on the anterior surface of the lens. It will normally remain unchanged but will migrate into the deeper cortex over time due to the apposition of new fibers (Fig. 7.13). Fig. 7.11 Typical symptoms include a crest-shaped whitish opacity beneath the anterior lens capsule along the visual axis. — Complicated cataract in chronic iridocyclitis. Fig. 7.12 This diffuse opacity proceeds from the posterior subcapsular cataract. Inflammatory precipitates indicative of chronic uveitis are also visible on the posterior surface of the cornea (arrow). Fig. 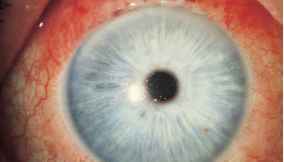 7.13 A contusion rosette posterior to the anterior lens capsule develops following severe blunt trauma to the eyeball. ❖ Infrared radiation cataract (glassblower's cataract): This type of cataract occurs after decades of prolonged exposure to the infrared radiation of fire without eye protection. Characteristic findings include splitting of the anterior lens capsule, whose edges will be observed to curl up and float in the anterior chamber. Occupational safety regulations have drastically reduced the incidence of this type of cataract. ❖ Electrical injury: This dense subcapsular cataract can be caused by lightning or high-voltage electrical shock. ❖ Cataract from ionizing radiation: See Chapter 18. Steroid cataract. Prolonged topical or systemic therapy with corticosteroids can result in a posterior subcapsular opacity. The exact dose-response relationship is not known (Fig. 7.14). 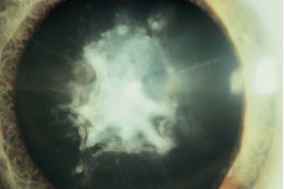 Other toxic cataracts can result from chlorpromazine, miotic agents (especially cholinesterase inhibitors), and busulfan (Myleran) used in the treatment of chronic myelocytic leukemia. There are many congenital cataracts. They are either hereditary or acquired through the placenta. Fig. 7.14 A dense pumice-like opacity develops in the posterior capsule following prolonged systemic steroid therapy for bronchial asthma. Familial forms of congenital cataracts may be autosomal dominant, autosomal recessive, sporadic, or X-linked. They are easily diagnosed on the basis of their characteristic symmetric morphology. Lamellar or zonular cataract. 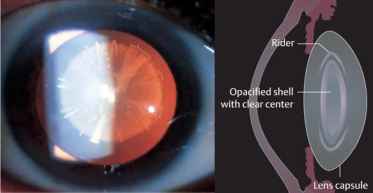 Opacities are located in one layer of lens fibers, often as "riders" only in the equatorial region (Fig. 7.15). Nuclear cataract. 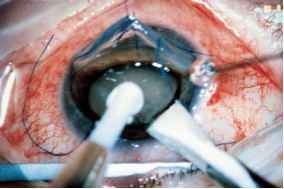 This is a variant of the lamellar cataract in which initially only the outer layer of the embryonic nucleus is affected (Fig. 7.16). Coronary cataract. This is characterized by fine radial opacities in the equatorial region. Cerulean cataract. 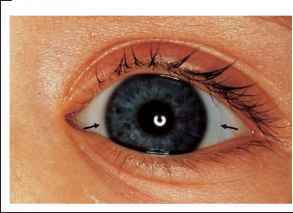 This is characterized by fine round or club-shaped blue peripheral lens opacities. Mostfamilial lens opacities do not impair vision and are not progressive. This also applies to rare lens opacities involving the capsule such as anterior and posterior polar cataracts, anterior pyramidal cataract, and Mittendorf's dot (remnant of the embryonic hyaloid artery on the posterior capsule of the lens; see Chapter 11). Fig. 7.15 The lens opacities ("riders") are located in only one layer of lens fibers, often only in the equatorial region as shown here. Fig. 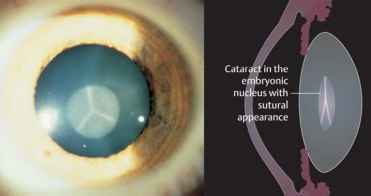 7.16 This variant of the lamellar cataract affects only the outer layer of the embryonic nucleus, seen here as a sutural cataract. Most of these cases involved total cataracts due to virus infection contracted by the mother during early pregnancy. This infection occurred during the fifth to eighth week of pregnancy, the phase in which the lens develops. Because the protective lens capsule has not yet been formed at this time, viruses can invade and opacify the lens tissue. The most frequent cause of cataract is a rubella infection contracted by the mother, which also produces other developmental anomalies (Gregg's syndrome involving lens opacity, an open ductus arteriosus, and sensorineural hearing loss). The cataract is bilateral and total and may be diagnosed by the presence of leukocoria (white pupil) and chorioretinal scarring secondary to choroiditis. In spite of theoretical approaches in animal research, the effectiveness of conservative cataract treatment in humans has not been demonstrated. H At present there are no available conservative methods to prevent, delay, or reverse the development of a cataract. Galactosemic cataracts (see p. 179) are the only exception to this rule. Cataract surgery is the most frequently performed procedure in ophthalmology. Earlier surgical techniques were dependent upon the maturity of the cataract. This is no longer the case in modern cataract surgery. ❖ In the presence of bilateral cataracts, the eye with the worse visual acuity should undergo surgery when the patient feels visually handicapped. However, this threshold will vary depending on the patient's occupational requirements. ❖ In the presence of a unilateral cataract, the patient is often inclined to postpone surgery as long as vision in the healthy eye is sufficient. ❖ In the presence of a mature cataract, it is important to advise the patient to undergo surgery as soon as possible. Will the operation be successful? The prospect of a successful outcome is important for the patient. Most patients define a successful outcome in terms of a significant improvement in vision. Therefore, it is important that the patient undergoes a thorough pre-operative eye examination to exclude any ocular disorders, aside from the cataract, that may worsen visual acuity and compromise the success of the cataract operation. Such disorders include uncontrolled glaucoma, uveitis, macular degeneration, retinal detachment, atrophy of the optic nerve, and amblyopia. H A detailed history of the patient's other ocular disorders and vision prior to development of the cataract should be obtained before surgery. ❖ Retinoscopy to determine visual acuity. ❖ Evaluation of the choroid figure (in severe opacifications such as a mature cataract). Cataract surgery is now performed as a microsurgical technique under an operating microscope. Modern techniques, microsurgical instruments, atrau-matic suture material (30 ^m thin nylon suture thread), and specially trained surgeons have made it possible to successfully perform cataract surgery without serious complications in 98% of all patients. The procedure lasts about 30 minutes and, like the postoperative phase, is painless. The patient may be hospitalized for 3 days, depending on the adequacy of postoperative care at home. Older patients who live alone may be unable to care adequately for themselves and maintain the regime of prescribed medications for the operated eye in the immediate postoperative phase. The operation may be performed as an outpatient procedure if the ophthalmologist's practice is able to ensure adequate care. General anesthesia: This is recommended for patients who are extremely apprehensive and nervous, deaf, or mentally retarded; it is also indicated for patients with Parkinson's disease or rheumatism, who are unable to lie still without pain. Local anesthesia (retrobulbar, peribulbar, or topical anesthesia): This is recommended for patients with increased anesthesia risks. ❖ Monofocal IOLs. The patient can select whether the strength of the artificial lens is suitable for distance vision or near vision. 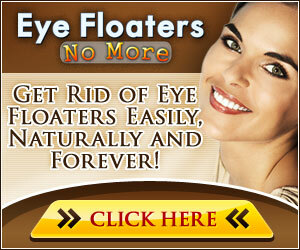 ❖ Bifocal or multifocal IOLs. These allow close and remote objects to appear in focus. However, it should be noted that bifocal and multifocal lenses do not achieve the optical imaging quality of monofocal lenses. Cataract eyeglasses: The development of the intraocular lens has largely supplanted correction of postoperative aphakia with cataract lenses. Long the standard, this method is now only necessary in exceptional cases. Cataract eyeglasses cannot be used for correcting unilateral aphakia because the difference in the size of the retinal images is too great (aniseikonia). Therefore, cataract eyeglasses are only suitable for correcting bilateral aphakia. Cataract eyeglasses have the disadvantage of limiting the field of vision (peripheral and ring scotoma). Contact lenses (soft, rigid, and oxygen-permeable): These lenses permit a near normal field of vision and are suitable for postoperative correction ofuni-lateral cataracts as the difference in image size is negligible. However, many older patients have difficulty learning how to cope with contact lenses. © can be combined with © and (3) . Difference in image size is small enough for the brain to fuse the images. Care and handling often difficult for older patients Vi sual acuity: Good with contact lenses, poor orientation without them. Irritation possible; dry eyes preclude contact lenses. The operation is performed on only one eye at a time. The procedure on the fellow eye is performed after about a week if once the first eye has stabilized. ❖ Couching (reclination): For 2000 years until the 19 th century, a pointed instrument was used to displace the lens into the vitreous body out of the visual axis. ❖ 1746: J. Daviel performed the first extracapsular cataract extraction by removing the contents of the lens through an inferior approach. ❖ 1866: A. von Graefe performed the first removal of a cataract through a superior limbal incision with capsulotomy. Intracapsular cataract extraction: Until the mid 1980s, this was the method of choice. Today intracapsular cataract extraction is used only with subluxation or dislocation of the lens. The entire lens is frozen in its capsule with a cryo-phake and removed from the eye through a large superior corneal incision (Fig. 7.17). 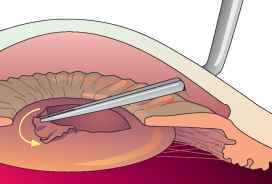 Extracapsular cataract extraction: Procedure (Figs. 7.18a - c): The anterior capsule is opened (capsulorrhexis). Then only the cortex and nucleus of the lens are removed (extracapsular extraction); the posterior capsule and zonule suspension remain intact. This provides a stable base for implantation of the posterior chamber intraocular lens. H Extracapsular cataract extraction with implantation of a posterior chamber intraocular lens is now the method of choice. Fig. 7.17 The lens is frozen in its capsule with a cryophake and removed from the eye through a large superior corneal incision. The photograph is from the surgeon's perspective. 190 7 Lens Extracapsular cataract extraction. Fig. 7.18 a The anterior capsule of the lens is opened with a continuous curvilinear cap-sulorrhexis. b The nucleus is destroyed by ultrasound (phacoemul-sification), and the fragments of the nucleus and cortex are aspirated. Today phacoemulsification (emulsifying and aspirating the nucleus of the lens with a high-frequency ultrasonic needle) is the preferred technique for removing the nucleus. Where the nucleus is very hard, the entire nucleus is expressed or aspirated. Then the softer portions of the cortex are removed by suction with an aspirator/irrigator attachment in an aspiration/irrigation maneuver. The posterior capsule is then polished, and an intraocular lens (1OL) is implanted in the empty capsular bag (Fig. 7.19a and b). Phacoemulsification and 1OL implantation require an incision only 3-6mm in length. Where a tunnel technique is used to make this incision, no suture will be necessary as the wound will close itself. — Patient with posterior chamber intraocular lens. Fig. 7.19 a The IOL is not noticeable in a normal pupil that is not under the influence of medication. b The same patient after dilation of the pupils with a mydriatic. The IOL is discernible under retroillumination. Advantages over intracapsular cataract extraction. Extracapsular cataract extraction usually does not achieve the same broad exposure of the retina that intracapsular cataract extraction does, particularly where a secondary cataract is present. However, the extracapsular cataract extraction maintains the integrity of the anterior and posterior chambers of the eye, and the vitreous body cannot prolapse anteriorly as after intracapsular cataract extraction. At 0.1 - 0.2%, the incidence of retinal detachment after extracapsular cataract extraction is about ten times less than after intracapsular cataract extraction, which has an incidence of 2 - 3 %. Epidemiology: Approximately 30% of all cataract patients develop a secondary cataract after extracapsular cataract extraction. Etiology: Extracapsular cataract extraction removes only the anterior central portion of the capsule and leaves epithelial cells of the lens intact along with remnants of the capsule. These epithelial cells are capable of reproducing and can produce a secondary cataract of fibrous or regenerative tissue in the posterior capsule that diminishes visual acuity (Fig. 7.20a). 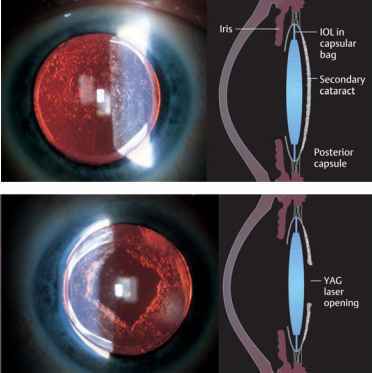 Treatment: A neodymium:yttrium-aluminum-garnet (Nd:YAG) laser can incise the posterior capsule in the visual axis without requiring invasive eye surgery. This immediately improves vision (Fig. 7.20b). ❖ Oculodigital phenomenon: The child presses his or her finger against the eye or eyes because this can produce light patterns the child finds interesting. 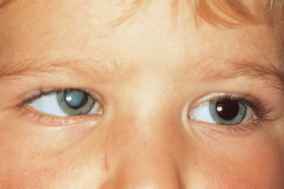 ❖ Strabismus: the first sign of visual impairment (Fig. 7.21). ❖ The child cries when the normal eye is covered. ❖ The child has difficulty walking or grasping. ❖ Erratic eye movement is present. Operate as early as possible: Retinal fixation and cortical visual responses develop within the first six months of life. This means that children who undergo surgery after the age of one year have significantly poorer chances of developing normal vision. Fig. 7.20 a Regenerative secondary cataracts lead to diminished visual acuity and increased glare. b Nd:YAG laser capsulotomy: the posterior capsulotomy removes the obstruction of the visual axis, and immediately improves vision. H Children with congenital cataract should undergo surgery as early as possible to avoid amblyopia. The prognosis for successful surgery is less favorable for unilateral cataracts than for bilateral cataracts. This is because the amblyopia of the cataract eye puts it at an irreversible disadvantage in comparison with the fellow eye as the child learns how to see. Fig. 7.21 One-and-one-half-year-old child with congenital cataract (leuko-coria) and esotropia of the right eye. nucleus. Secondary cataracts are frequent complications in infants. Therefore, the procedure should include a posterior capsulotomy with anterior vit-rectomy to ensure an unobstructed visual axis. The operation preserves the equatorial portions of the capsule to permit subsequent implantation of a posterior chamber intraocular lens in later years. Refraction changes constantly: The refractive power of the eye changes dramatically within a short period of time as the eye grows. The refraction in the eye of a newborn is 30-35 diopters and drops to 15-25 diopters within the first year of life. Refractive compensation for a unilateral cataract is achieved with a soft contact lens (Fig. 7.22). The use of soft contact lenses in infants is difficult and requires the parents' intensive cooperation. Refractive correction of bilateral cataracts is achieved with cataract eyeglasses. Refraction should be evaluated by retinoscopy (see Chapter 16) every two months during the first year of life and every three to four months during the second year, and contact lenses and eyeglasses should be changed accordingly. Implantation of posterior chamber intraocular lenses for congenital cataract is not yet recommended in children under three years of age. This is because experience with the posterior chamber intraocular lens and present follow-up periods are significantly less than the life expectancy of the children. In addition, there is no way to adapt the refractive power of the lens to changing refraction of the eye as the child grows. Refractive compensation with soft contact lens. Fig. 7.22 In a unilateral cataract, a contact lens provide refractive compensation (the arrows indicate the edge of the contact lens). gap with respect to the normal fellow eye. Regular evaluation of retinal fixation is indicated, as is amblyopia treatment (see patching). ❖ Subluxation (partial dislocation): The suspension of the lens (the zonule fibers) is slackened, and the lens is only partially within the hyaloid fossa (Fig. 7.23). ❖ Luxation (complete dislocation): The lens is torn completely free and has migrated into the vitreous body or, less frequently, into the anterior chamber. Etiology: There are several causes of lens dislocation (Table 7.5). Most frequently, it is due to trauma (see contusion of the eyeball). Later in life, pseudoexfoliation may also lead to subluxation or luxation of the lens. Hereditary causes and metabolic disease produce lens displacement early yet on the whole are rare. Additional rare causes include hyperlysinemia (characterized by retarded mental development and seizures) and sulfite oxidase deficiency (which leads to mental retardation and excretion of cysteine in the urine). 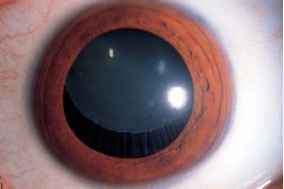 H The most frequent atraumatic causes of lens dislocation are Marfan's syndrome, homocystinuria, and Weill-Marchesani syndrome. - Ectopia lentis: isolated and mono-symptomatic. - Marfan's syndrome: characterized by arachnodactyly, long limbs, and laxness of joints. - Weill-Marchesani syndrome: symptoms include short stature and brachydactyly. - Homocystinuria (metabolic disease): characterized by oligophrenia, osteoporosis, and skeletal deformities. - Trauma (probably the most frequent cause). - Pseudoexfoliation (in advanced age). - Ciliary body tumor (rare). - Large eyes with severe myopia and buphthalmos (rare). - Complete or partial displacement of the lens (for example, into the anterior chamber). - Lens is abnormally round; lens displacement is usually superior and temporal; zonule fibers are elongated but frequently intact. - Lens is abnormally round and often too small; lens is usually eccentric and displaced inferiorly. - Lens displacement is usually medial and inferior; torn zonule fibers appear as a "permanent wave" on the lens. - Zonule defects due to deformation can cause subluxation or luxation of the lens. - Zonule weakness due to loosening of the insertion of the fibers on the lens can cause lens displacement. - Lens is displaced by tumor. - Zonule defects due to excessive longitudinal growth can cause lens displacement. Symptoms: Slight displacement may be of no functional significance to the patient. More pronounced displacement produces severe optical distortion with loss of visual acuity. Diagnostic considerations: Cardinal symptoms include tremulous motion of the iris and lens when the eye moves (iridodonesis and phacodonesis). These symptoms are detectable under slit-lamp examination. Treatment: Optical considerations (see symptoms) and the risk of secondary angle closure glaucoma from protrusion of the iris and dislocation of the lens into the anterior chamber are indications for removal of the lens. Subluxation of the lens in Marfan's syndrome. Fig. 7.23 The lens is displaced superiorly and medially. As the zonule fibers are intact, a certain measure of accommodation is still possible.